Get your home properly inspected for charger installation before purchasing an all-electric vehicle like the Mitsubishi i. While installation will only cost a few hundred dollars for most residences, some may require thousands in electrical upgrades first. Want a practical electric car for commuting, or as a second car? The 2012 Mitsubishi i is the simply the most affordable and efficient pick. 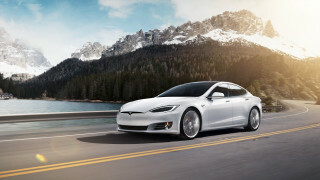 If you want a full electric car—that's legal on all U.S. highways, complies with passenger-car safety standards, and can do all that a gasoline-engine car can do around town—your options for 2012 are still very limited. If you don't have the nearly $60k to cough up for the Tesla Model S, it's either the Nissan Leaf or the new 2012 Mitsubishi i. With a starting price of $29,125, not counting the $7,500 federal tax credit, the i is the lowest-priced electric car in the U.S. market. And among electric cars, the new i is also the most efficient one yet, carrying an official EPA rating of 112 MPGe (miles per gallon equivalent). The i's roots are in a Japanese-market minicar (or so-called kei car) of the same name. There the i has a little gasoline engine mounted at the back, under the cargo floor, but in its place here is a 49-kW (66 hp) synchronous permanent magnet motor and 16-kWh lithium-ion battery. Like more electric cars, the Mitsubishi i is at its best in city driving, where its torquey motor can propel this minicompact away from traffic lights with more gusto than many gasoline vehicles. But highway stints are best kept occasional; while it can reach 81 mph, it feels sluggish above 50 or 55, and driving range drops significantly. The i can return a respectable 62 miles, officially, on a charge, although gentle driving and liberal use of regenerative braking (which captures some energy lost in braking), can return longer distances, if you're confident about pushing it. While the i looks diminutive by U.S. standards, its interior is surprisingly spacious, and as comfortable as you would probably ever need given you'll only be spending an hour or two in the vehicle at a time (limited by range). Four six-footers will fit in the i, though in order to get enough cargo space for a typical grocery run you'll need to fold down the rear seatbacks. Ride quality is smooth, and the suspension is tuned soft. While Mitsubishi doesn't have sales plans quite as grand as those of Nissan or Tesla, the MiEV, as it's also badged, isn't just a limited-edition specialty vehicle, the automaker insists. 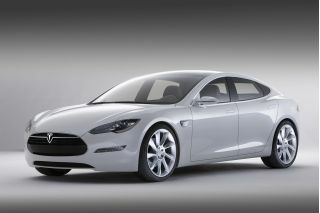 It hopes to sell about 1,500 in the first model year and about 5,000 for 2013. The somewhat homely 2012 Mitsubishi i makes no bold style statement, but its design efficiency and simplicity earns points. At about 145 inches long, the Mitsubishi i is one of the smallest vehicles on sale in the U.S. market—about the same length as a Toyota Yaris hatchback, longer than the Mini Cooper or Fiat 500 but shorter than the Nissan Leaf. With very little in the way of sculpting or accents between the front and rear wheels, it's undoubtedly tall and slab-sided—made even more ungainly from some angles by its very narrow (for the U.S. market) 62.4 inches of width. You're likely to either see the new Mitsubishi i's styling as either cute, or a little too, well, cute. With its buglike, rounded features in front, and long windshield, transitioning into a decidedly utilitarian, boxy look in back, it effectively combines a little of the snub-nosed charisma of a Smart Fortwo or Fiat 500 with a microvan-like tail. The U.S.-spec i is altogether about eight inches wider, compared to the original version sold in the Japanese and European markets, for practical reasons like bumper regulations, side airbags, and better highway stability, but we think the wider stance also gives the i a better look from most angles. One other concession to DOT approval we don't like nearly as much: the odd dual-wiper setup, with one of the wipers especially long and bent at an odd angle, replacing the otherwise elegant single-wiper setup that other markets get. Inside, there's none of the design complexity or sci-fi futurism that's expressed in the cabin of the Leaf or Volt; instead, the i's interior appointments feel like those of a no-frills, affordable small car. It's almost drab, with the center console and shifter module mounted plainly on the floor, but a nicely contoured dash plus upscale two-tone looks in the SE model help keep it on the cheerful side. The 2012 Mitsubishi i performs reasonably well for lower-speed commuting, but it's out of sorts on the highway. The Mitsubishi i doesn't have a lot of power—just 49 kW (66 hp) for a 2,579-pound vehicle—but as is the case with most electric cars, it's surprisingly strong and responsive at low speeds. 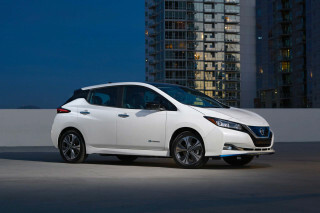 That's because its electric motor system's peak torque of 147 pound-feet is available right away, with no need to rev. That said, it doesn’t have the sort of mammoth torque available from a standing start like the Leaf, but once underway it can squirt ahead from say, 5 mph to 25 mph, seemingly in just a second or so—surprising surrounding drivers as they expect that sort of dash to be accompanied by a roar of high-revving engine. Just as in a number of EVs, the Mitsubishi feels considerably more sluggish past 50 or 55 mph; it gets from 55 to 70 with relative ease, but climbing from 70 to 75 and above is much slower; on our non-eco-conscious run we saw an indicated top speed of 82 mph. On the bright side, the widened track appears to help; the MiEV feels stable and planted at those speeds, though the quick steering required attention and very small adjustments. The U.S.-spec i is surprisingly fun to drive around town. This little minicar, despite being so tall, takes tight corners with a planted, stable feel, thanks to its very low center of mass (lower than the gasoline version)—and at a curb weight of 2,579 pounds in base form, it simply doesn’t feel portly. The steering, too, caught us by surprise as one of the better racks we’ve sampled as of late, with actual surface feedback and nice weighting—not really a surprise given the excellent steering of the Lancer-family vehicles, but nevertheless a surprise given the i’s appearance. That all said, the very soft suspension calibration means there’s lots of lean and protestation if and when you find that driver’s road. From the driver's seat, what you'll notice first, likely, is that there’s no complicated interface. You simply put the key in the slot, turn it to the on position, and you’re ready to shift to Drive and go. The battery range bars remind you how much charge remains, with a simple trip computer to click through, and a sweeping analog gauge showing you the degree of discharge or regenerative braking. In addition to the usual ‘P R N D’ positions along the shift gate, there are ‘Eco,’ and ‘B’ positions. During regenerative braking, the motor runs as a generator, and when you shift to reverse, the motor is electrically reversed rather than shifted to a reverse gear. Company officials recommend doing normal driving in Eco mode, then clicking up to ‘D’ for long uphill grades or fast merges; on long downhills ‘B’ is recommended for maximum regenerative braking. Even in ‘D,’ lifting the throttle slows you rapidly, dialing up more regen than in the Leaf, and in Eco you’ll soon find yourself using the mild braking that’s built into the accelerator calibration. The brakes themselves (ventilated discs in front, drums in back) are up to the task in hard braking—although with such a regen calibration, with careful driving, their pads might even last the lifetime of the vehicle, or close to it. While the MiEV wasn’t designed, ground-up, as an electric vehicle like the Leaf, you might suspect that it had been; that’s because the rear-engine, rear-wheel-drive layout of the gasoline-powered Mitsubishi i minicar proved to be especially friendly for packaging a battery pack and electric-drive components. The surprisingly small 16 kWh (330V) lithium-ion battery is placed low, beneath the floor of the vehicle. And its slab-sided, boxy body is a good thing for fitting people and stuff. MiEV is shockingly spacious inside, with more than 50 cubic feet of cargo space when you fold the 50/50-split backseats forward. Cargo space is a lot smaller with those seats up, but the back seats are actually usable for adults. Even those far over six feet tall fit just fine in the back seat, with enough headroom, along with enough knee room provided the occupant ahead wasn’t back all the way. The big drawback when it comes to interior space is width; the MiEV is just 62.4 inches wide—which is already about eight inches wider than the Japanese-market version; unfortunately very little of that added width—used to install side-curtain airbags, and to widen the track a few inches—carries over to the interior. Controls and switchgear in the i feel remarkably straightforward, bordering on drab. And the entire climate-control setup looked a bit like part of an older audio-system faceplate. The Mitsubishi i has a surprisingly comfortable ride—definitely tuned on the soft side—while the wheels positioned way out to the corners help completely avoid the fore-aft bobbing motion that can make short cars hard to tolerate on choppy roads. The rather tall sidewalls and a somewhat soft suspension calibration probably go a long way toward reducing road noise; it’s very quiet inside, with very little engine whine—though at 22 mph and below you hear a light-saberish sound that’s supposed to alert pedestrians. There's no reason to believe that the 2012 Mitsubishi i electric car is any less safe than other small cars its size. 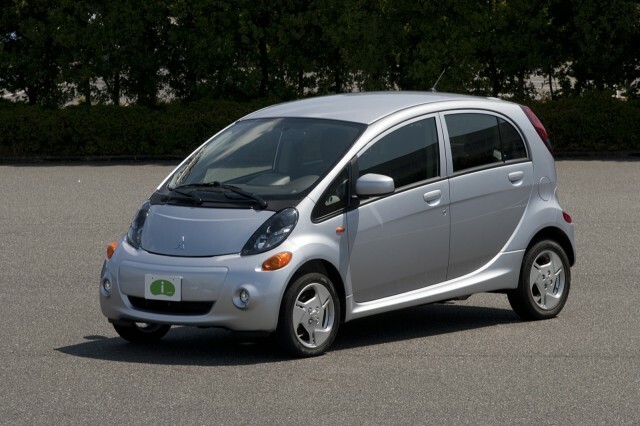 The 2012 Mitsubishi i is one of the smallest, lightest vehicles for sale in the U.S. market. But that shouldn't keep you from considering this innovative electric vehicle. In addition to roof-mounted side-impact airbags and seat-mounted side bags, the 2012 Mitsubishi i includes standard electronic stability control, anti-lock brakes with Brake Assist, and a Brake Override system that prioritizes the brake pedal over the accelerator. It also includes LATCH connectors in the back seat, for mounting infant and booster seats. In Euro NCAP testing—the benchmark for safety in Europe—the i-MiEV earned a decent four out of five stars overall. Although it's unlikely that the federal government will make the I part of its testing for 2012, we hope to update this safety assessment as the Insurance Institute for Highway Safety (IIHS) might perform some of its tests. The 2012 Mitsubishi i comes with most of the same features as the Nissan Leaf, at a price that's thousands lower. While the cabin of the Mitsubishi i might feel like that of a typical subcompact, its equipment set is definitely not that of a bargain-basement small car. Two models of the i will be offered—a base ES and premium SE model. The base i stands as a strong value, including air conditioning, a four-speaker, 100-watt sound system, keyless entry, power accessories, and a six-way-adjustable driver's seat. Also included is a remote system that allows users to pre-activate the climate control and charging timer to help preserve driving range and optimize comfort. The SE will include a more attractive two-tone instrument panel, eight-speaker, 360-watt sound, leather steering-wheel and shift-knob trim, upgraded door trim with cloth inserts, premium seats, fog lamps, and matte-metallic inserts. Also available will be a remote system for climate control and charging. Both models will include a security system and a heated driver’s seat with timer. Unless you have a charging station at work that you can use daily (and plan to very rarely charge at home), you'll want to get the Eaton 220V charging system, at a cost of $700 plus installation—arranged through Best Buy stores. Otherwise, on a standard 110V household outlet the i will take about 22.5 hours to charge from zero to full. Another extremely useful feature that's optional on the i is a DC fast-charging system. Using the Chademo charging standard—if you happen to be in a place like Portland, where DC quick chargers are publicly accessible—the MiEV's battery can then be charged from zero up to 80 percent in between 20 and 30 minutes. Major options include a $150 Cold Zone package (on either model) that adds a battery warming system plus heated side mirrors, and on the SE trim, a Premium Package, bringing a hard-drive-based navigation system with rear camera, USB port, and FUSE hands-free link. That package also includes the aforementioned Chademo quick-charge system. The only thing that the Mitsubishi i is missing, compared to rivals like the Nissan Leaf, is a sophisticated display system; instead, the i's trip computer is about what you'd find in any affordable subcompact. Depending on your wants and needs, you might find that refreshing, or somewhat off-putting. 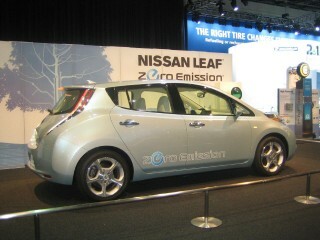 Want the most efficient 2012 passenger vehicle of any kind? The Mitsubishi i is it. The 2012 Mitsubishi i (what it’s called here) is the most efficient DOT-legal vehicle for sale in the U.S. market, with an official MPGe (miles per gallon equivalent) rating of 112. The i’s driving range is shaping up to be about ten miles shorter than the Nissan Leaf—which is all the more impressive considering its 16 kWh battery capacity, versus the Leaf’s 24 kWh. Simply put, the Mitsubishi is even greener in this respect. While the official EPA range for the i is 62 miles, Mitsubishi says that a real-world range of 85 to 89 miles is possible with gentle driving and light use of accessories. With very cautious driving and no accessory use, some MiEVs have seen just over 100 miles on a charge. Our editorial team will update this after our first longer-term loan of an i, but in a first drive we were on track for seeing about 75 miles from a charge, in somewhat gentle driving. Looking for a different year of the Mitsubishi i?